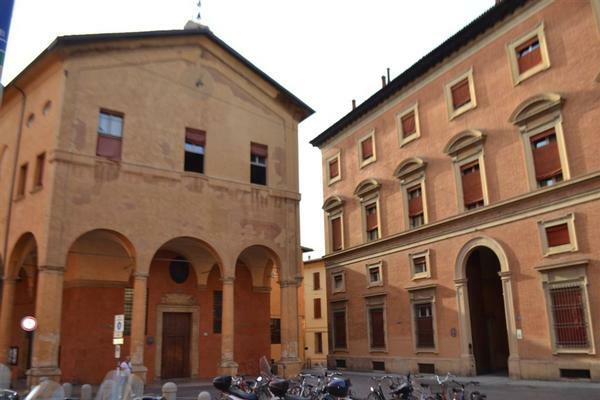 The workshop in Bologna about the New Approach to string instruments, based on Kato Havas's texts, took place on Saturday 2 and Sunday 3 March, 2013, at the music school of the Cultural Association "La Barberia", organized by Vladimiro Cantaluppi. This too was a great opportunity, with participants coming from as far away as S. Maria di Leuca as well as from closer places. As usual, like in previous workshops, the atmosphere was very friendly. Thank you very much to the organizer and all the participants. 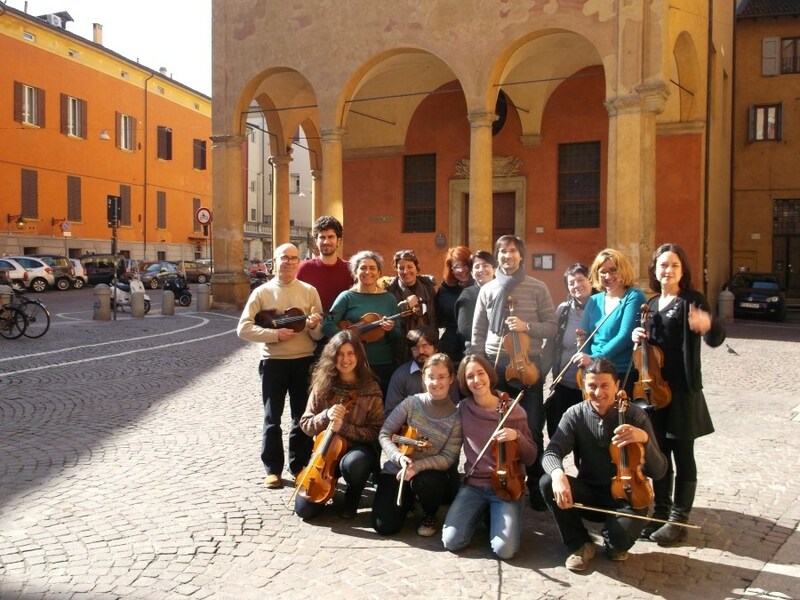 The workshop in Bologna on the New Approach, as well as the previous ones, was open to everybody, especially violinists and violists, to participants of all levels. Each one introduced him/herself briefly, saying what they did and how they got there. 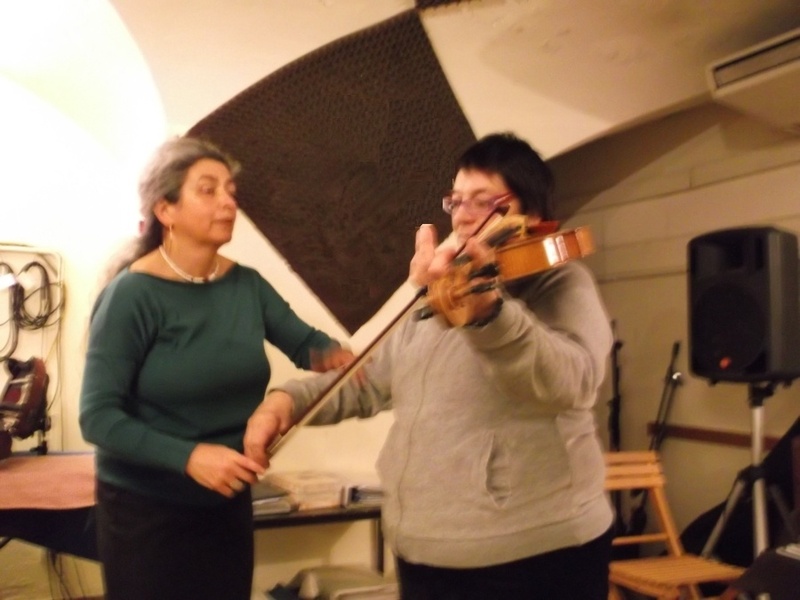 This time we had 14 participants of different ages and backgrounds: 12 violinists and 2 violists, including 7 teachers of various schools and one academy, 2 students of the last year of conservatoire, someone who started as an adult and played for fun and a participant who had never placed her hand on a violin, but wanted to start. This is always very useful, because everyone can verify, on themselves and on others, the effect of small changes and the improvements that these cause, like for example the elimination of tension in the thumbs and in the left wrist, through the "giving hand". All participants had read one or more books or seen any of Kato Havas videos, so they had questions about these, so we started talking about the seminary just as Kato Havas has developed the New Approach over the years and how she changed some aspects of it to make it more and more simple and eliminate even the slightest position or even an idea that could cause tensions. 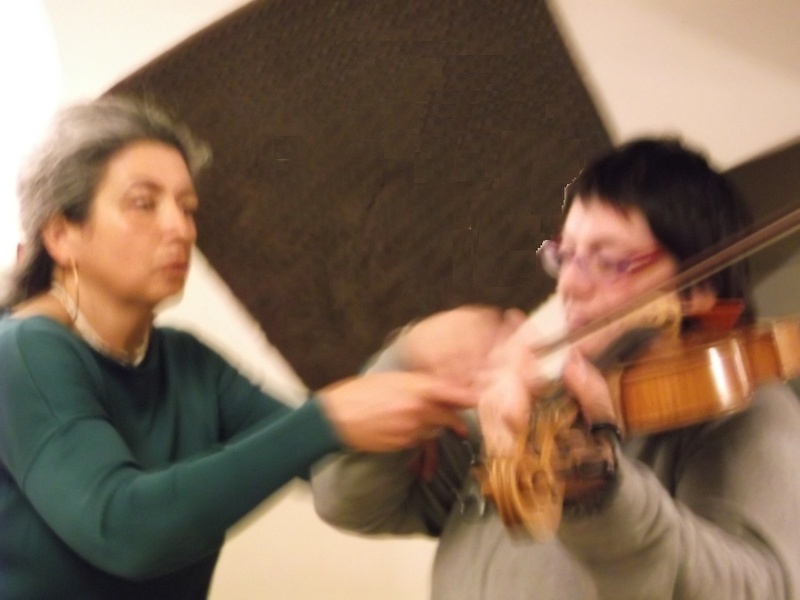 Having a participant who had never placed her hand on a violin enabled everyone to see how, from the very first violin or viola lesson, the student can produce a beautiful tone, instead of torturing himself and others for months with horrible noises. To achieve this, it is necessary to explain the student the concept of playing using the fundamental balances that can be found in the natural movements of our body and show how to apply these balances, instead of force, to produce the sounds. Thus, in the case of a beginner, it is possible to prevent the physical blocks, that is, the overall rigidity that almost all players have which causes the bad sound. 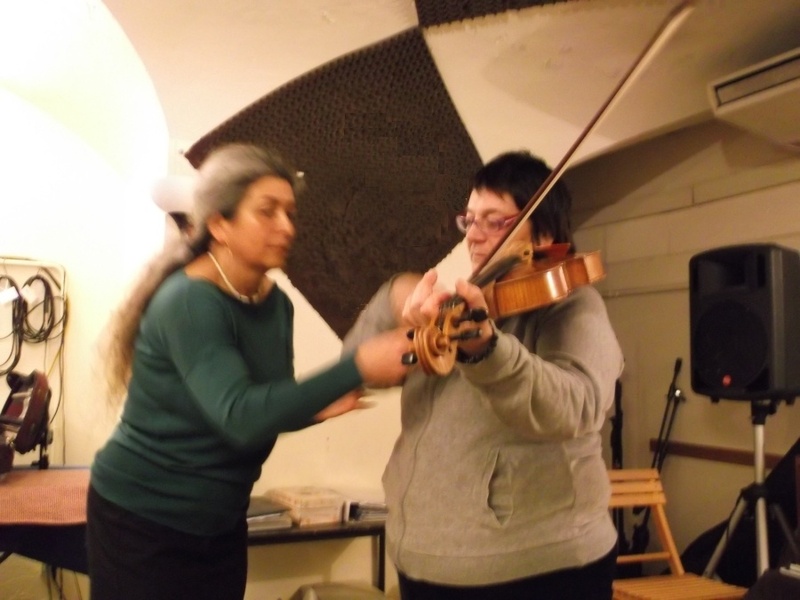 In this case we put into practice, with a viola and without even a shoulder rest, the "no violin/viola hold" and "no bow hold". The first, harmonious note, with the finger movement coming from the base joint. In general, I saw that what almost all the participants to the workshops, and musicians in general, share, is a more or less serious fear (to put it mildly) of playing in front of someone other than very benevolent friends or relatives. This confirms how ahead of her time Kato Havas was when she wrote her book Stage fright (1973), when no one talked about this nor about physical injuries, and its importance in helping people to solve them. 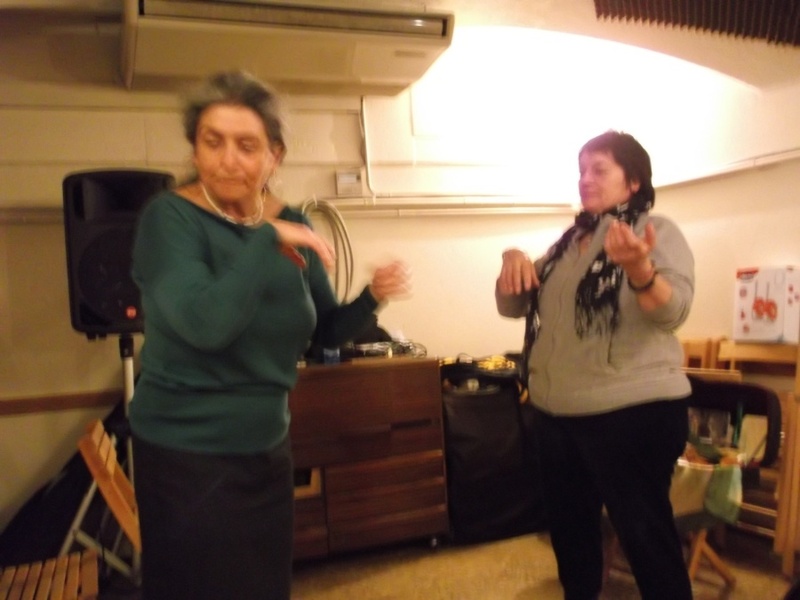 Also on this occasion, we saw that the mere fact of eliminating physical blocks, by establishing the "rhythmic pulse" throughout the body and clapping, and singing the music before playing helped a lot to eliminate anxiety. Also playing the music after singing it, makes it flow much better and improves the tone. If then one learns to sing the note names while playing, it will be possible to eliminate this anxiety even more, because singing while playing is what coordinates all movements in one single action and keeps our mind busy with music, so that it becomes impossible to think of other things that cause fear during a performance. I repeat for the umpteenth time because it is so important and fundamental. In addition, we saw how important the use of "imagination" is. This means becoming one with the scene of the music work, creating a story to tell, "wearing the clothes", as an actor would, and "act out" the story told by this music. All this and singing the music with the rhythmic pulse before playing it and while playing it, completely changes the result. Again, everybody could see and hear the "before" and "after." 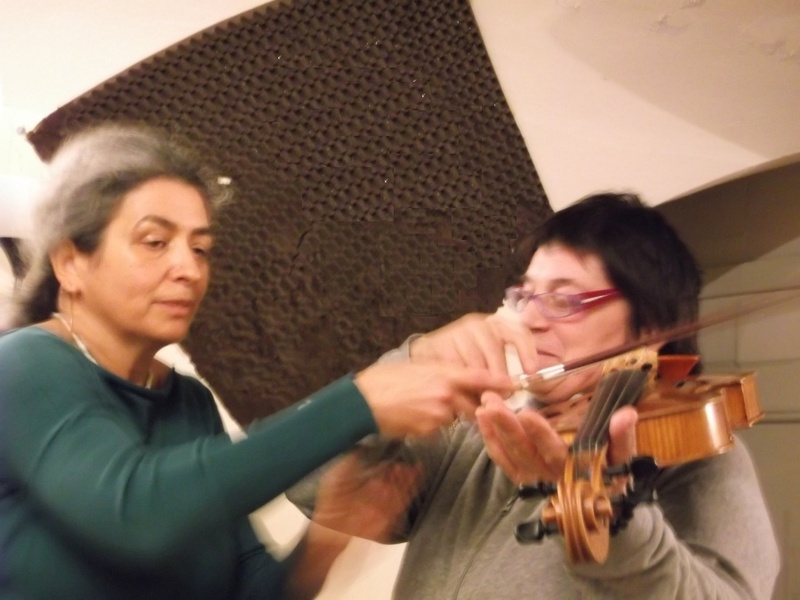 We also dealt with several other aspects, for example, how to study fast passages, how to eliminate the problems caused by string crossings by eliminating them altogether, by practicing the "no string crossing" etc..
One participant had problems because of severe pain in her jaw, caused by the fact that she had been pressing her head very hard on the chin-rest to hold the violin. She had managed to reduce the problem by playing without shoulder-rest and thus pressing less. We saw that the remedy for this is the "no violin hold" and how it is possible to play without even resting our head on the chin-rest, to counter the habit of pressing down. To conclude the workshop, in a short time we put together and performed for ourselves the first movement of Telemann's concerto for four violins in G major. We first sang the piece all together, each one singing his own part, clapping our hands to get an idea of ​​the music without being worried about the instrument's technical aspects, then we played it. This way we put into practice some aspects we had been talking about and closed the days happily with some music. Once again, having a mixed group of participants is very useful for all involved, because everyone can see that he or she is not the only person who has certain difficulties and that it's possible to do something to eliminate them. The application of the New Approach principles is good for everyone and at any level! The New Approach principles are really simple, and when you understand them, they seem fairly obvious: using the natural movements, not forced ones, and playing with your head, not with your fingers, that is, do not take my words literally! play with your mind controlling every single movement, not mechanically. Although the principles are simple, you cannot change everything in a week, you need a bit of patient work, very slow practice to apply them fully, but you can learn them in a short time, much shorter than the time already spent to learning to play. See you on the next occasion! What have you learned that you think you can apply? I'VE LEARNED TO KEEP MY HEAD LIFTED! It would be nice to apply more of the workshop, in some way, for example, by learning all together a little melody on which to apply the concepts explained, which are many and difficult! Nice that everyone played something, it's possible to learn many things also by watching others! Making everything start from the inside, movements not from the periphery, where the movement seems to come from, but from their real sources, whether they are the shoulder blades, the base of the fingers, etc..
By seeing the application of the principles laid down in the various volumes, many things finally were clarified to me. The workshop was very interesting and useful. What I found very important was the concept of no violin hold, particularly the concept of freeing my head and not pressing it on the chin-rest. For me, being able to play applying these principles will be very important from now on, considering the problems I had and still have with my jaw. I also find that knowing and learning that the movement comes from the stronger joints, i.e. from the shoulder and not from the fingers with regard to the bow, is fundamental, and likewise for the left hand finger movement. For years I've been suffering from tendonitis in my left hand little finger (4th finger), until I met a teacher (Alessandro Ferrari), who realized that my movement was wrong and corrected it. With you, Monica, I had the confirmation of this principle. I am very sorry that I have not learned these basic principles earlier, but it is never too late to know them and pass them on. I'd like to follow and participate in other workshops. Thanks again for everything and see you soon. I think the no bow hold is fundamental and so is its contact with the strings. Musical imagination and practicing without the instrument are things that I had already been working on and I'm glad I've heard others talking about it. The no violin hold seems impossible to me. The workshop was interesting and the mix of participants levels was wonderful. Maybe two days are few, or 13 participants are too many! Very useful and very interesting, in general the subject of the softness of the limbs, but even more that about the mobility of the thumb based on the fingers used, without the constraint of a fixed position. 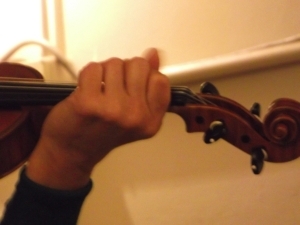 But also the use of the right thumb in the conduct of the bow for a bigger tone. My approach with an instrument that today you let me touch with my hands. Really, my heart jumped at the sound of these beautiful sounds. and being able to convey to your listeners the joy of life through the depths of music. The most interesting approach of this method is the idea of basically thinking about the music and the desire to express your musical creativity, not from the technical side of the hands but from the inside of your body to the outside; but if your body is stiff it becomes a barrier to the expression of your creativity. I'll test these concepts on myself so that I can pass them on to my students. I was able to focus on serious physical blockages in my playing, and I've realized that so far all the exercises that I've been doing had little to do with music but it was just mere technique. The workshop seemed to me very well set up and for 2 days much has been said already! Now it's up to me apply myself. The workshop helped me to understand more closely and concretely, what to do to play without fear. In particular, what to do to have a beautiful tone from the beginning. 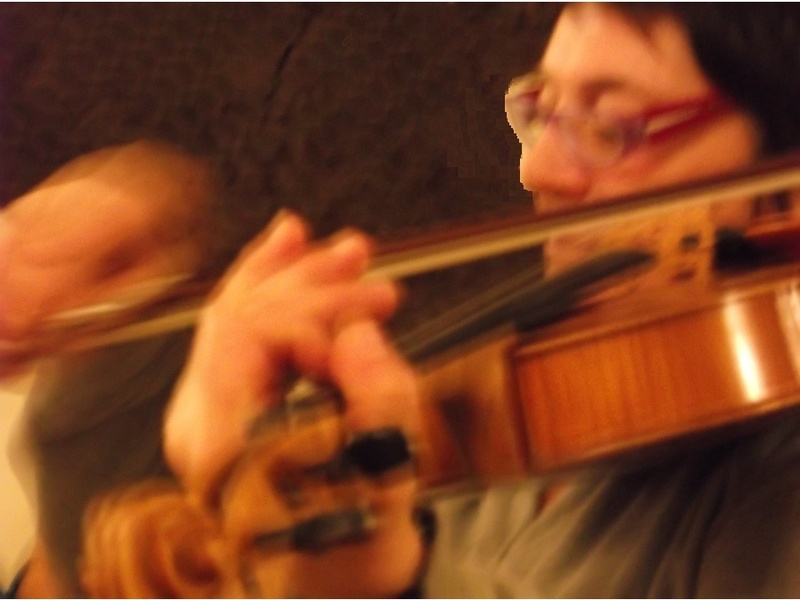 It was a real illumination to understand that there is no violin and no bow hold, and have a left hand always in motion (searching for the sounds). Thanks for everything.